Parkinson’s Disease (PD) is the second most common neurological disease behind Alzheimer’s. It affects about 500,000 people in America with 60,000 new cases each year. The symptoms include some or all of the following: slouched posture, stiffness, expressionless face, shuffling gait, occasional frozen movement, tremors, balance problems and whisper soft voice. It is treated conventionally by prescribing dopamine to replace the loss of its natural production in the brain. It is considered progressive, degenerative and incurable. In the past year I have had four cases that responded well to a combination of soft tissue work and Core Movement Integration. 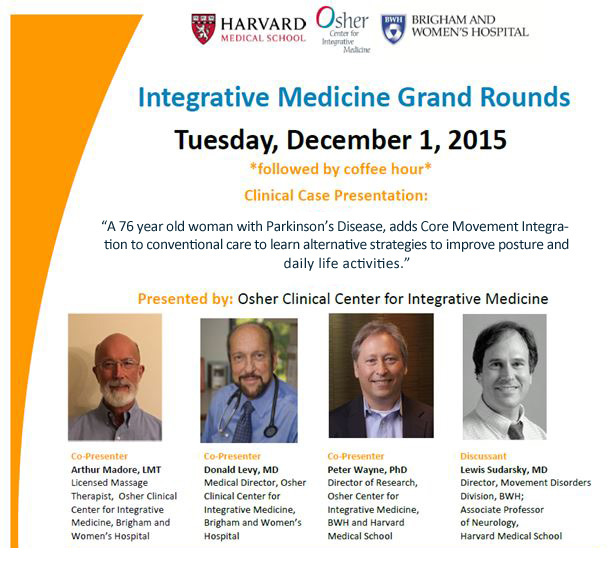 In December of 2015 I presented one such case at the Integrative Medicine Grand Rounds at the Brigham &Women’s Hospital. We hope to make the video of this presentation available at a future date. The subject of the presentation is a 76 year old woman with PD for eight years. Her chief complaints were posture, getting out of bed, and fatigue. I saw her for 5 sessions. The results were so impressive that I chose her to present. Months later she still reports that the new way of getting out of bed is becoming natural and no longer a struggle. I am encouraged that this combination of manual therapy and whole body movement education can help a number of people with similar restrictions. People with PD have the same aches and pains as the rest of us. They have back pain and muscle cramps etc. These problem can be addressed by good manual therapy. The big challenge is that the PD patient continues to have the chronic posture and restricted movement patterns that lead to these problems. It is a kind of vicious cycle. Not only does this disease take away their natural fluidity, it also discourages them from doing any exercise. Most movement is such a big effort. The disease presents in a way that causes strains and pains in the body and the tight muscle tissue reinforces the pattern. In the talk I liken it to having a tight wet suit with the front panel shorter than the back. The person is always pulled into a bent over posture which also can pull on the face, and even the vocal chords. Changing this tension makes it easier for them to stand straighter with less effort and be less exhausted walking and doing their daily routines. I have had spontaneous changes in the volume of the voice when I pulled up on the fascia in the front of the chest and neck. It was quite dramatic as the patients voice went up an octave with just light but focused tissue work. In another case relaxing the central nervous system using CranioSacral therapy eliminated tremors for several days. Another feature is that many habitual behaviors are no longer easy to do. Initiating movement can sometimes be impossible as they can freeze, as if you severed the connections from their brain to their limbs. This can be miraculously changed by simple cuing as in looking at a laser beam that is shined in front of their feet. In the video case presentation you can see how posture and movement can be improved by treating the connective tissue ( myofascia ) with manual techniques. With more suppleness it is easier for them to learn alternate ways of using the body that reduces the struggle many patients have with simple activities like getting out of bed. This combination of stretching tight tissue by itself helps but would be short lived if you didn’t address the movement pattern. In my experience, PD patients have shown the capacity to learn new ways to stand, walk, and exercise. By using the body in a more integrated way there is much less effort and the tissue gets to remain more elastic. In the book by Norman Doidge, PhD, ‘ The Brains Way of Healing” there is the story of John Pepper an 81 year old man from South Africa with PD who changed his symptoms by mindful walking. I spoke with him recently and he still briskly walks 7 km a day and remains free of most of the PD symptoms. When he does not walk for even short periods the symptoms return. You can read more about it in his e-book ” Reverse Parkinson’ Disease’. He tells me that he plan to visit Boston this year to share his experience to other PD sufferers. In addition to Core Movement Integration many other movement programs have shown benefit. Studies have supported the effectiveness of Tai Chi, boxing, tango, and cycling. In general, exercise is now recommended by neurologists. Body work makes this option easier and more productive. Core Movement Integration opens up alternative patterns of using the body so there is less effort and more fluidity.